It is that time of the year when drumsticks are available in plenty. I make a number of dishes using drumsticks, which as you would know are called : Mashingasaang in my mother tongue, Konkani; Shevgyacha Shenga in Marathi, Sahajan in Hindi, Murungakkai in Tamil, and Nuggekkai in Kannada. 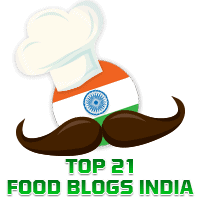 Elsewhere in this blog, you will find recipes for Potato & Drumsticks Upkari, and Magge Mashingasaang Koddel, which are popular dishes in our GSB Konkani cuisine and Shevgyachya Shenganche Pithla from Maharashtrian cuisine. My friend, Sandhya N. Kamath pointed out a recipe from Tamilnadu called Murungakkai Kara Kuzhambu which I tried out and we liked very much. 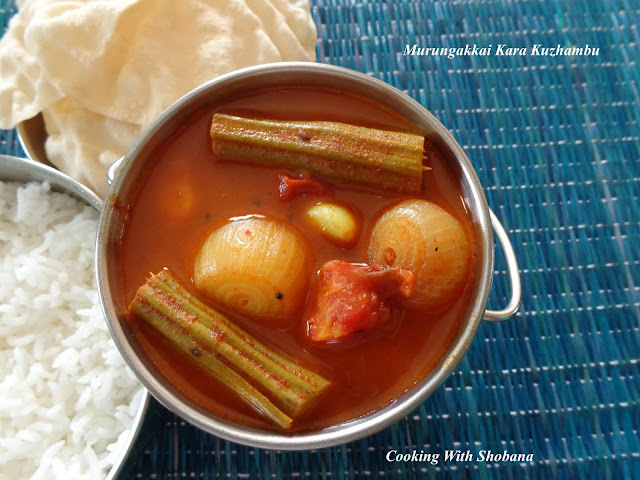 This is adapted from Murungakkai Kara Kuzhambu by Hema Subramanian of Home Cooking. The recipe called for the use of gingelly oil but since I don't ordinarily use it, I used my regular Saffola cooking oil.